T’was the week before Christmas … which means it must be time for Google Sightseeing to pay our traditional annual visit to some festive locations where the seasonal spirit is in full force. This year we hop in our magic sleigh1 to visit a selection of giant Santa statues, beginning with the world’s biggest in North Pole, Alaska. We first visited this Santa three years ago but updated Street View imagery gives us a much better look at the bright red 12m tall Saint Nick who is in the process of making his list, and checking it twice. This blog post gives a fascinating glimpse at its origins in Seattle. 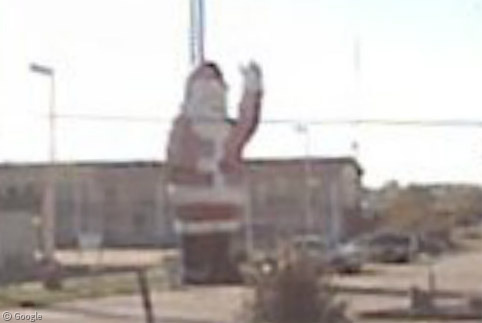 Heading to Oxnard, California, we find only the top-half of a Santa who has apparently got a bad headache, judging by the hand position and big frown on his face. Maybe all the cookies, milk and glasses of whisky were too much for him? 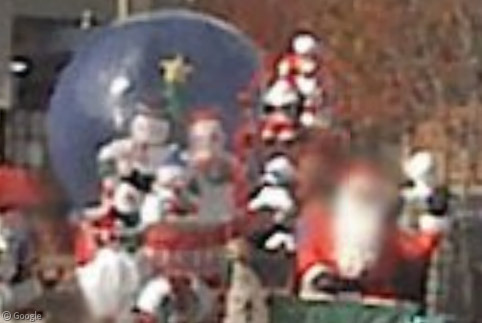 As vigilant as ever, Google has blurred the faces of the accompanying nutcrackers to protect their identities. This 6m tall Kris Kringle is actually quite a venerable specimen, having spent 50 years on the top of a candy store before being moved to his current location eight years ago. Read the full story in this blog post or this LA Times article, which includes a slideshow. The state of Indiana seems to have a particularly fondness for Santa Claus. We first visited the town that bears his name back in 2008, but neglected to show the large statue that sits outside the town hall, surrounded by festive red benches. Two separate can be spotted (one standing, one sitting) outside a hotel, while on the outskirts of town is a much older statue; in fact it is claimed to be the oldest Santa statue in the world. It dates to 1935, shortly after the town’s residents realised they lived in a locale with a name that could be exploited for commercial gain. Originally thought to be 7 metres of solid granite, time and weathering have revealed that it is in fact made of concrete! 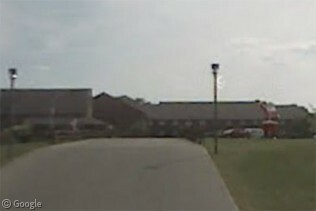 Unfortunately it is too far from the road for early Street Views to give a good view. 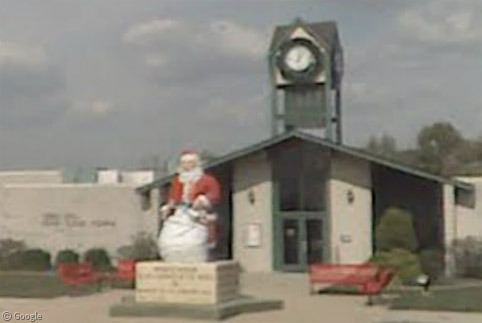 Not quite so blurry is the 11m tall Father Christmas found an hour’s drive to the west in Haubstadt. 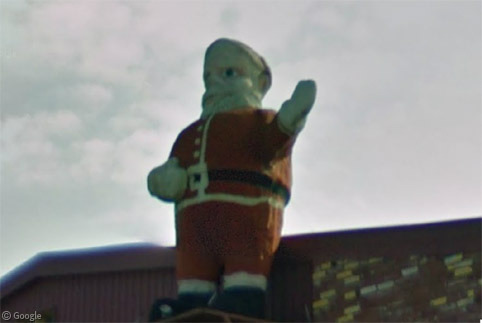 Roadside America reports that the surrounding derelict buildings have been demolished, leading to fears that this Santa may disappear before too long. 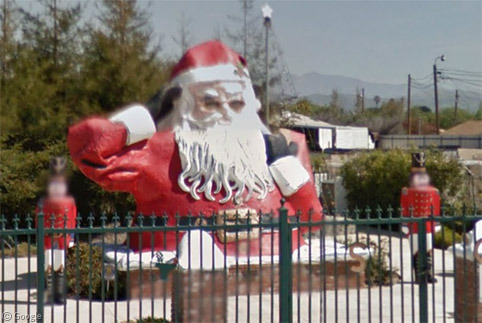 Many businesses adorn their premises with statues of Santa, though generally they’re not quite as disturbing as this one in Fresno, California. Finally, just to prove that it’s not just the US that has giant Santa statues, in Lyngen, Norway, a large Julenissen2 overlooks the harbour. If you know of any other giant Santa statues please post them in the comments. Merry Christmas from all of us at Google Sightseeing! Glasses of whiskey? Is this a UK Christmas tradition that I’m not aware of? If so, I think I should take part in it this year! Yup, Santa is suposed to get a glass of Whisky. Children up and down the land would be devastated if he didn’t! Santa gets around. Here he is in Tokyo, France, and Wollongong. Best of all, actual footage of St. Nick climbing into a house! 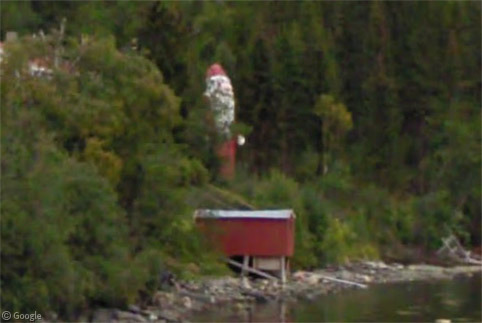 Go a bit east on Saint Nicholas drive on the image from North Pole, Alaska and you’ll see that the google face-blurring algorithm has decided to blur the face of the big santa in the parking lot of Santa Claus House. Cool to see. My hubby grew up in North Pole, AK. There also are several in St. Niklaus, Switzerland.